Walden Pond Press, 9780061996306, 288pp. The life of crime is good.Mac has taken down legendary high school crime boss Staples, business has been booming, and Mac and Vince are getting ready for middle school baseball tryouts. But this can’t last. Mac has always tried to keep his friends close and his enemies closer. But what happens when you can’t tell the difference? This dilemma walks into the fourth stall in the form of Trixie Von Parkway—an eighth grader with a mean look and an even meaner predicament. The new science teacher is terrorizing her, and she needs Mac to get him off her back. Seems simple enough, but as Mac starts to dig deeper, he finds even more trouble brewing at his school, including a new administrator bent on destroying his business, and indications that Trixie isn’t who she claims to be. In the past, the worst thing that could have happened to Mac was that he might lose a little money, maybe catch a beating. 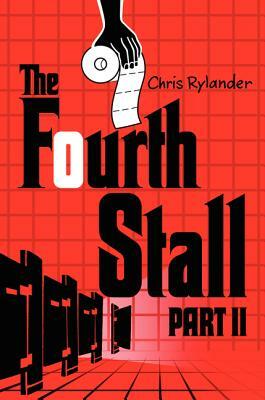 In The Fourth Stall Part II, though, there’s going to be much more on the line than that. Here is an original-a story that really gets how guys are pals. It’s also funny, mysterious, and true to the heart of what really matters when you are in middle school. Do yourself a favor. Read it. Now. Debut novelist Rylander mines a substantial amount of humor and heart from this combination hard-boiled crime novel and middle-grade character piece. A light and enjoyable caper. Draws in even the most apprehensive young reader… A robust story rich in action, adventure, humor, and friendship. Mac narrates the tale with the arch flatness of a 1940s satire of the noir detective genre…Excellent.